Tacofino has opened up yet another location and this time it’s under the Bentall 5 building in the Coal Harbour and financial district area. This location is called Tacofino Oasis. It may be a bit tricky to locate though if you are not familiar with the area as it’s in the back part of the building away from the sidewalk. It’s in the same little plaza as Fujiya. This entry was posted in Food Reviews, Mexican/South American and tagged burritos, tacos. The Tap Shack is like a smaller version of Tap and Barrel located along the seawall by the new convention centre. It’s counterpart Tap and Barrel is literally steps away but if you want to be closer to the seawall you can stop by at the Tap Shack instead. They also have a location by the Burrard Bridge. Happy hour is between 3-6pm everyday. My co-workers and I came here last week to enjoy the last bits of summer and patio weather. Their patio area overlooks Coal Harbour and they also have indoor seating for the cold, winter days. This entry was posted in American/Burgers, Food Reviews and tagged chocolate cake, happy hour, pizza, tacos. 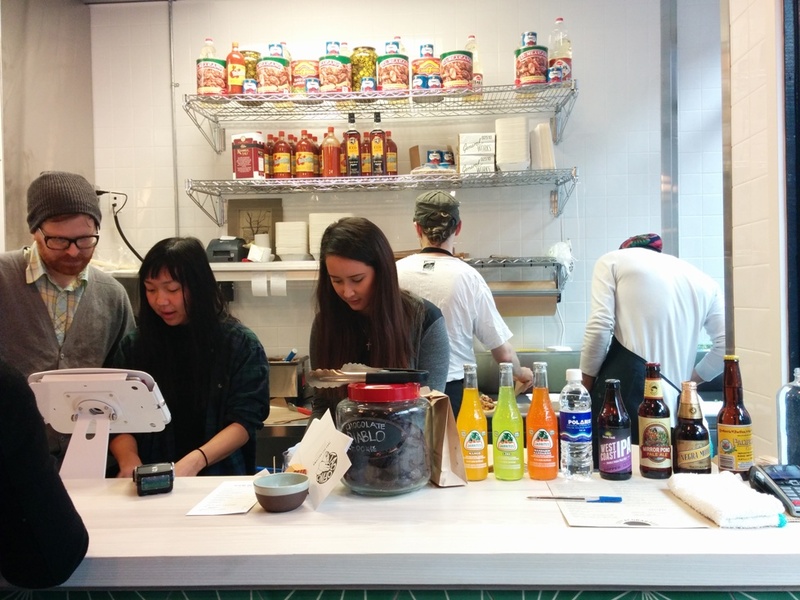 Earlier this year Tacofino opened up a restaurant in Gastown and I visited their Burrito Bar (see post here). Their taco bar opened for lunch a few months later so I finally had the chance to try it out. You can enter the Taco Bar side from Blood Alley or just walk through the Burrito Bar side. This entry was posted in Food Reviews, Mexican/South American and tagged al pastor, fish taco, tacos. 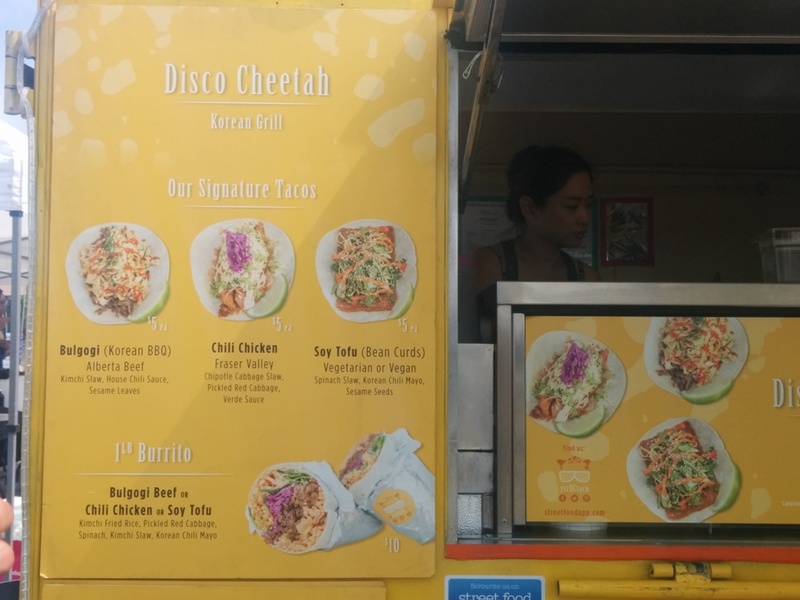 Disco Cheetah just opened up last year and I finally managed to try them at the Food Cart Fest this month. Their truck is a bright yellow color and easy to spot! I was excited to try Korean-Mexican fusion food. 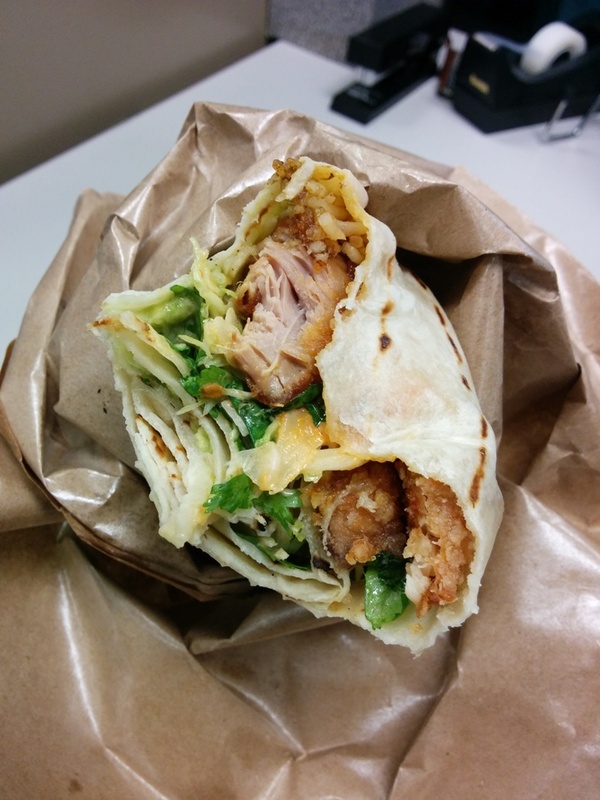 This entry was posted in Food Trucks and tagged burritos, food truck, Korean, tacos. Tacomio, located in Gastown, is the newest taco joint to open and it’s also just a block away from Tacofino. Talk about competition! This entry was posted in Food Reviews, Mexican/South American and tagged carnitas, chicharrones, chips, fish taco, guacamole, tacos. My idea was to go to Earnest Ice Cream first and then eat lunch/brunch but then as we walked by Graze which is right next door, it seemed like a nice place to have brunch so we just went in. Also it didn’t look busy so we wouldn’t have to wait for a table either. The restaurant had a nice serene vibe to it and there was a large colorful mural on one wall. Graze is a vegetarian restaurant and I had totally forgotten about that but we decided to give it a try. These were the Breakfast Tacos made with scrambled tofu, tomatoes, peppers, black bean and corn on organic corn tortillas. On the side were some rosemary potatoes and house greens. I think the sauce in the middle was suppose to be the spicy salsa roja but it didn’t taste very spicy. The tacos tasted spicy though so maybe the salsa was already on top? Yes I have no idea what I’m talking about but for some vegetarian tacos they were pretty good. I didn’t miss the meat. 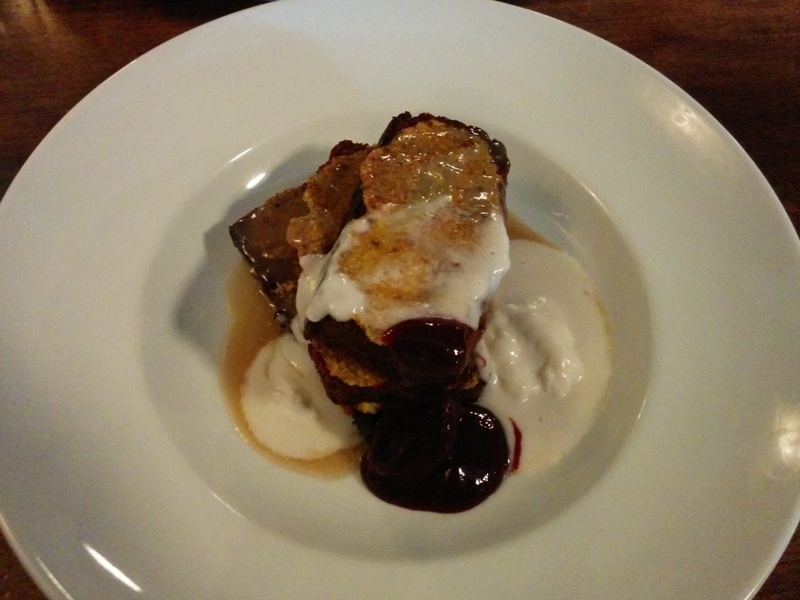 I went for a sweet brunch item, the Carrot Cake French Toast. Sounds decadent right? There were three large slices served with smoked salt caramel sauce, whipped coconut creme and some sort of fruit compote. The carrot cake was dipped and grilled in a flax-polenta batter which gave it a slightly weird flavour for me since I think the edges were a bit burnt too. Basically all the flavours tasted a bit unusual to me at first, they just didn’t seem like they were suppose to go with carrot cake? For example, the whipped coconut creme looked like icing but a much less sweet version and the smoke caramel sauce was a bit weak and didn’t really add much for me and finally for the fruit compote, I don’t even know what fruit they used but it was off-putting… Like not terrible but not pleasant either so I avoided most of it. Ok so maybe I wasn’t really sure what I was expecting since this is not your standard carrot cake or french toast. The carrot cake itself was very moist and full of carrot flavour. Despite all the condiments, it wasn’t too sweet. Ok so I don’t think I would come back just because I think I prefer more meat in my meals and maybe things that sound less healthy… the food just differed from my norm? Maybe I need to try more vegetarian places! I heard the Acorn is good. 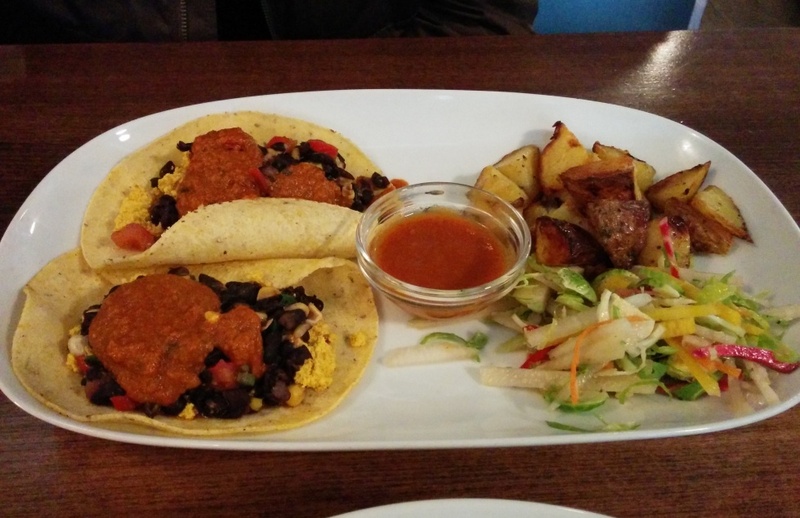 This entry was posted in Breakfast/Brunch, Food Reviews and tagged brunch, carrot cake, french toast, tacos, vegetarian. My friends and I wanted something quick to eat so we spotted Salsa Agave and it looked decently busy so we thought we’d give it a try. I’m all for trying new things! Most of the things on their menu are around $10. Complimentary chips and dip were offered for the table but the dip tasted a lot like tomato sauce/marinara sauce and not salsa which I thought was weird. The chips were okay. For some reason my picture refuses to show up sorry! Someone ordered a burrito. Didn’t try this but it seemed really big and served with guacamole and sour cream on the side. This entry was posted in Food Reviews, Mexican/South American and tagged burritos, Mexican, tacos. 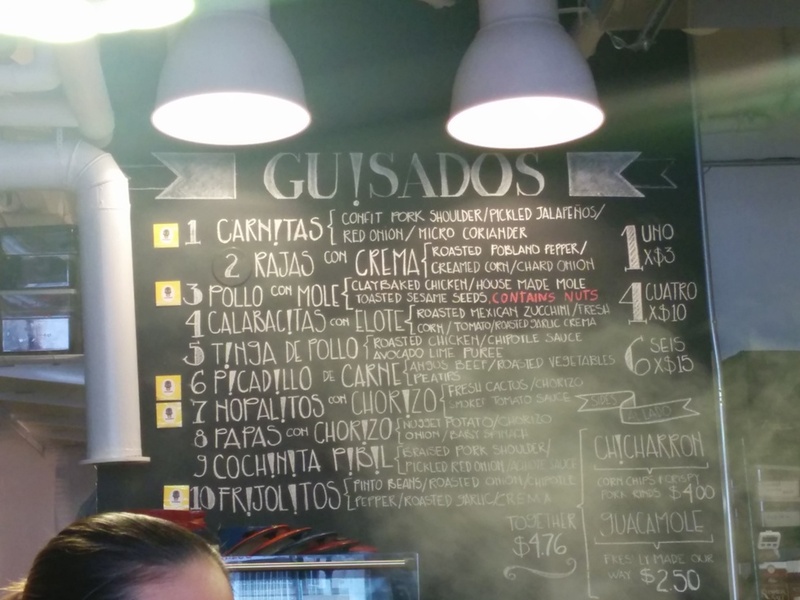 Sal Y Limon: Best Burritos? So I rarely ever eat Mexican food really and when I do it’s not authentic so I can’t say I know much about burritos but so far these are the BEST that I’ve ever eaten! Ok so I don’t eat many burritos so you gotta keep that in mind. However, I am now going to try all the burritos I can find so I can compare them! Sal Y Limon is located on Kingsway and Fraser in this small complex that I would never visit otherwise. In other words, it’s a bit of a hole in the wall but I’m so glad I found it! The inside looks alright and there was a steady stream of customers. The parking lot is really small though. I had the Pierna Burrito which was slow roasted pulled pork (yes I still have a thing for pulled pork) and it’s nice that they cut it in half for you so you can see all the lovely ingredients. 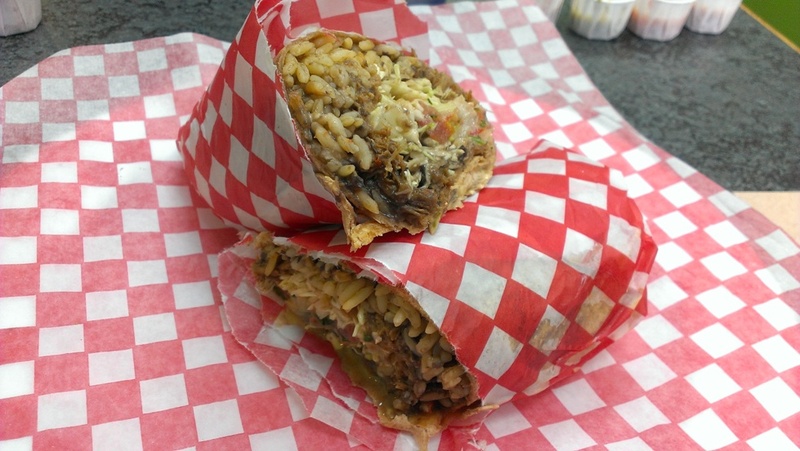 The burrito was really juicy and flavourful and the rice was really good. I didn’t even mind the beans in there. You can also customize it so if you want extra jalapenos or something, go for it! I just had everything in it. I just can’t describe how good this was!!! 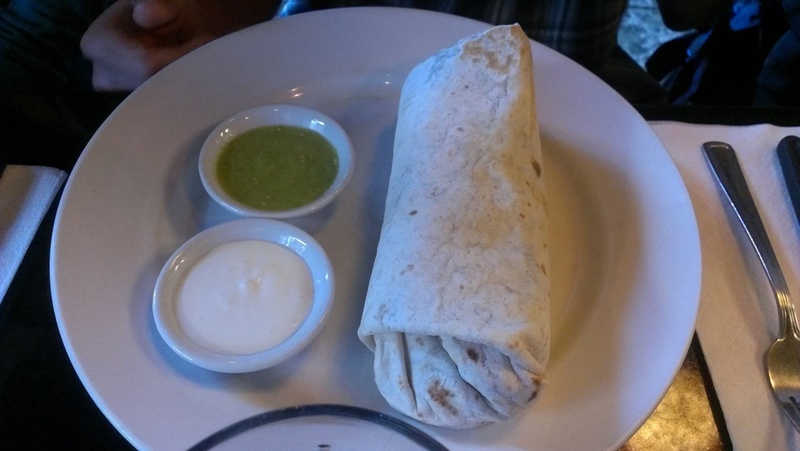 The pork was really soft and tender too and the burrito was just mildly spicy to me even though there were jalapenos. The tortilla wrap was quite soft and thin and it held everything really well. I thought the burrito might be bigger but it was a good size for me and the flavour made up for it! Price was good too. They also have a variety of different salsas and sauces you can use ranging from mild to spicy! You can try them all by putting them in little containers. My co worker got some tacos which she also thought were pretty good and comparable to La Taqueria. 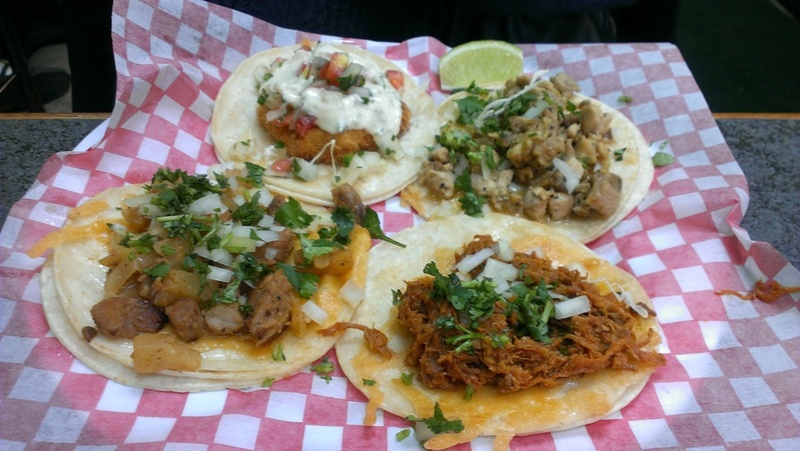 Top left: fish taco, top right: chicken, bottom right: pulled pork, bottom left: marinated pork with pineapple. She said the fish taco was the best! This place was so good that my co workers and I decided to come back the following week. :D Yes we were that impressed! 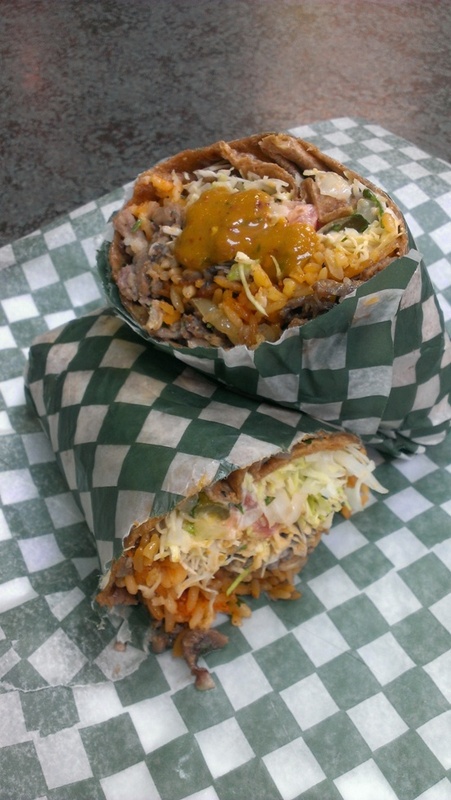 I got another burrito, this time I had the Cordero Al Cilantro which was lamb marinated in cilantro. I put some chipotle sauce on top before I took the picture. I liked the lamb even more than the pulled pork!!! It was just marinated even better and the flavour was stronger? If you don’t like lamb then you’re probably not going to get this but if you do it’s delicious! 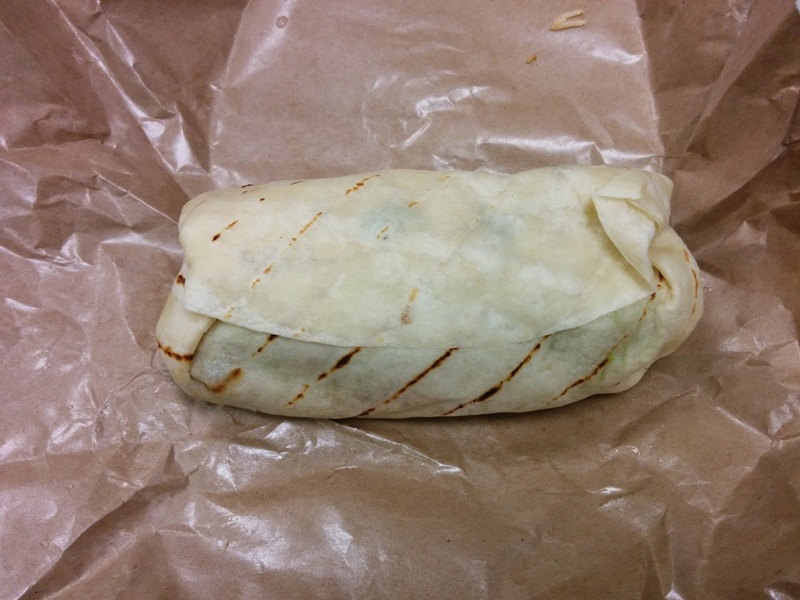 I noticed the second half of the burrito got really oily though because the wrapper was wet. =/ Other than that it was still really good! I wouldn’t coming back again soon but it can get messy! I have to try more Mexican food now! Burritos here I come! This entry was posted in Fast Food, Food Reviews, Mexican/South American and tagged burritos, Mexican, tacos. Since I work really close to La Taqueria my coworkers and I decided to try it today! I’ve heard a lot about it and whenever someone mentions tacos, it’s either Chronic Tacos or La Taqueria that comes to mind. It’s conveniently located right across from the Broadway Canada Line Station. We noticed that they had a daily special: $9.50 for 4 meat tacos. I wasn’t that hungry so I just got two. I had no idea what to get off the menu so I just picked two things. So after staring at the menu board for a while and feeling slightly overwhelmed, I settled on the Al Pastor and Carnitas. They’re $2.50 each for the meat ones and $2 for the vegetarian ones. We gave the server our names and he brought our food to the table shortly afterwards. Al Pastor on the right and Carnitas on the left. The tacos come on two little soft flour shells and seriously the closest description of what they taste like is pulled pork but with different sauces. They were both very flavorful but I didn’t really like the taste of the taco shells though. I think it’s the doughy taste? They also have 4 different hot sauces ranging from mild to hot at their condiment stand along with some pickled red onion and jalapenos that you can add to your taco. This was my friend’s plate which consisted of the Al Pastor, Pollo Con Mole, Tinga De Pollo? and the mexican potatoes which was recommended to us by the cashier. I tried the potatoes one and it was good but I think I prefer meat in my tacos! It looked quite busy and full when we walked in around 4pm but since it’s pretty much fast food the place emptied out again by the time we were finished. Remember to get lots of napkins because these things are messy! 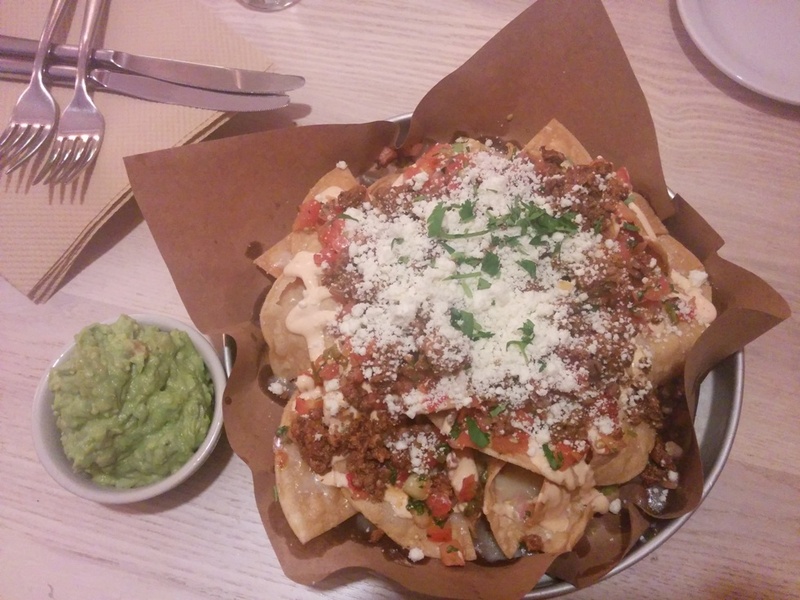 This entry was posted in Food Reviews and tagged La Taqueria, Mexican, tacos.